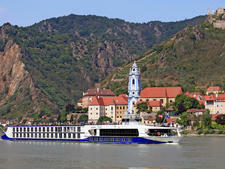 The 167-passenger MS Robert Burns is the 13th ship to join the expanding river cruise fleet run by U.K.-based tour operator Riviera Travel. 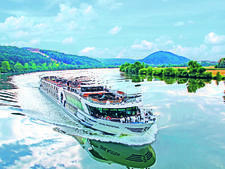 Although Riviera might not be that familiar in North America, the company has a long-established pedigree stretching back to 1984 and is the U.K.'s largest provider of European river cruises. 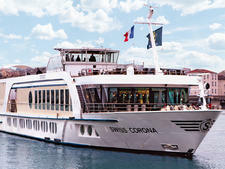 In 2017 it introduced its competitively priced cruises to the U.S. market and Australia under the name Riviera River Cruises with an office based in Connecticut. 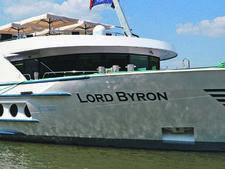 In common with its other vessels, MS Robert Burns was constructed to Riviera's high specifications by the Swiss river ship builder Scylla (the same company responsible for luxury river cruise line Tauck's fleet) and is billed as a "five star" riverboat. Its "Britishness" sets it apart from vessels that predominantly cater to U.S. travelers and this novelty will appeal to North Americans who prefer not to travel with large numbers of their fellow country folk and want to experience something a little different, including the option to sample typically British foods such as a breakfast "fry up" (eggs, bacon, sausages and baked beans) and the convenience of having a kettle in every cabin to make a "proper" cup of tea with boiling water. Despite being a new vessel with modern amenities, such as USB ports in every cabin and a splash pool on the Sun Deck, MS Robert Burns has the atmosphere of an upscale "country house" hotel that oozes the traditional style and elegance of bygone times. The sumptuous marble-floored lobby is topped by a glittering chandelier and throughout the ship there are a wealth of wrought-iron, glass and polished wood fixtures and fittings. 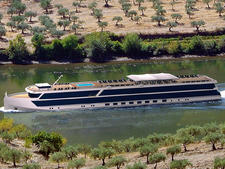 The 88 cabins comprise standard staterooms and two categories of suites, including several with walk-out balconies. MS Robert Burns is the same size as ships that carry up to 190 people, so there is plenty of public space and passengers can expect a high level of personal service. Solo travelers, who often get a raw deal on other cruise lines with punitive single supplements, get a great deal with Riviera. On each sailing, five lower deck cabins are set aside for single passengers with no additional supplement. Each season there are also a number of exclusive solo sailings with no single supplements at all, so solos can book a suite and pay the usual per person fare. Unlike many other lines, Riviera does not include drinks with lunch and dinner -- one of the reasons its prices are very competitive -- and passengers can opt to pay for them individually or purchase a drinks package. Riviera also has a very transparent pricing policy, with no discounting. This means all passengers pay the same so there are no awkward conversations over dinner discovering fellow shipmates paid a bargain basement fare. 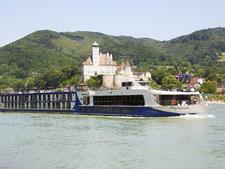 MS Robert Burns sails on five itineraries on the Rhine, Main and Danube ranging from a four-night Christmas market cruise to 14-night voyages. Up until 2017, Riviera River Cruises catered solely to U.K. passengers, building up a loyal following in its homeland with a high number of repeat cruisers. 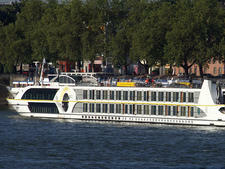 The line now sells its cruises in North America and Australia, although these passengers will be in the minority. Anyone with an interest in Great Britain will enjoy traveling with these polite folks who are always happy to chat about their country (and the royal family). In common with most river cruises, passengers are mostly over the age of 55, and made up of well-traveled retired couples and groups of friends interested in culture and history. As Riviera offers a great deal for singles -- with five no supplement cabins set aside on every cruise -- solo travelers won't feel out of place and will meet like-minded cruise companions. There is no set dress code and passengers are advised to dress however they feel most comfortable. Jeans, casual pants, T-shirts and sweaters are ideal for shore excursions, and comfy shoes or sneakers are a must, particularly for walking in historic European towns and cities where there are cobbled and uneven surfaces. It should be noted that the weather in Europe is very changeable, even in the summer, so it is advisable to bring layers, a hat and rain jacket, along with warmer attire if you plan to sit on the outside deck in the evening. At night, most people change into smart pants or chinos for men and two pieces and smarter pants or dresses for women. It should be noted that Brits tend to dress up more for dinner than North Americans, so although it is not compulsory, you can expect to see some men in dress shirts, jackets and ties. Fares cover all meals, daily excursions, complimentary tea, coffee and Wi-Fi. Other beverages are charged as consumed, or passengers can prebook a drinks package covering beer, wine, juice and soda with lunch and dinner for $129 per person ($159 in 2019). Mineral water is not included and can be purchased for 2.25 euros for 25cl bottles or 3.75 euros for 75cl. The onboard currency is the euro. Being a U.K. operator, where tipping is not as customary as it is in North America, gratuities are not included and are discretionary. The recommended amount is 5 to 10 euros per person, per day, which is less than many lines catering predominantly to the North American market. For gratuities, an envelope is left in the cabin at the end of the cruise and can be deposited in a box at the reception desk. Passengers might also want to carry some small denominations in local currency to tip local guides and shore excursion bus drivers. 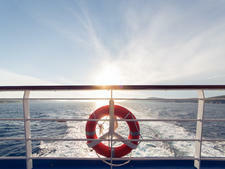 Onboard accounts can be settled in cash or by Visa or Mastercard. Note: American Express is not accepted. In North America and Australia, Riviera's itineraries are sold on a cruise-only basis, so air and transfers are not included as many passengers choose to spend time in Europe independently before joining the sailing. On certain itineraries, Riviera offers land-based extensions. Riviera Travel welcomed the 169-passenger Oscar Wilde to its growing fleet of river ships in May 2017. The Swiss-built ship is exclusive to the British market.